SkyTeam, the global airline alliance partnering eleven members – including Aeroflot, Aeroméxico, Air France, Alitalia, China Southern Airlines, Continental Airlines, Czech Airlines, Delta Air Lines, KLM, Korean Air, and Northwest Airlines – and three Associate carriers – Air Europa, Copa Airlines and Kenya Airways – sets itself apart by offering an exclusive experience for all passengers. 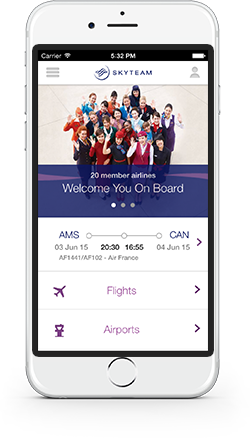 Issued monthly, SkyTeam NewsFlash provides media with key updates and insights on alliance activities. SkyTeam at London Heathrow International Airport: SkyTeam is moving forward with its new alliance co-location facility in Terminal 4 of London Heathrow International Airport. SkyTeam customers traveling through Heathrow will have access to several service enhancements including more check-in desks, additional bag drop-off locations, and ample common-use self-service kiosks, which will be shared among alliance members operating out of the terminal. The customer-focused facility will include an airport ticket office, a premier check-in area and the first SkyTeam-branded lounge. The multi-floor lounge will be complete with standard features passengers have come to expect, as well as new amenities that take advantage of the latest in design technology. The co-branded lounge will include several amenities such as a wellness centre with showers and therapeutic services, as well as free wireless Internet access. The lounge is expected to open mid-year. SkyTeam Mileage Upgrades Program: SkyTeam continues to collect feedback and results to improve future phases of the mileage upgrade program that launched in November 2008. The alliance is on track to introduce an automated version of the program later this year, including expanded criteria for eligible flights, the inclusion of Associate-operated flights and the ability to make and confirm requests online. This program enables some SkyTeam frequent flyers on international flight itineraries to use their miles to upgrade to Business class on most SkyTeam member airlines. Frequent flyer programs are one of the most important alliance benefits for travelers, and SkyTeam continues to pursue enhancements to this program. TAROM: The Romanian airline, TAROM, is on track to join the SkyTeam alliance as an Associate airline in late 2009. TAROM must meet a set of predetermined requirements in areas such as operations, technologies and products, to ensure that its quality of service standards and operating performance are in line with those of SkyTeam member airlines. Once these conditions have been met, TAROM will receive a formal approval from the SkyTeam Governing Board, becoming the fourth SkyTeam Associate airline, after Air Europa, Copa Airlines and Kenya Airways. SkyTeam signed an Alliance Associate Adherence Agreement (SAAAA) with the Romanian airline in May 2008.
skyteam.com: SkyTeam will launch a redesigned version of its Web site in 10 additional languages, including Chinese, Czech, Dutch, French, German, Italian, Japanese, Korean, Russian and Spanish, this spring. The alliance launched the new site in English in December 2008. The overhaul included a fresh new look, new navigational features and revamped travel tools. Corporate Social Responsibility and Sustainability: All SkyTeam members signed a corporate social responsibility charter in 2008, and the alliance will continue to identify ways to bring this statement to life in 2009. This statement serves as a unifying platform that details the commitment of SkyTeam members to protect the environment, promote social responsibility and realize equitable, economic prosperity. For more information on SkyTeam’s worldwide network, please visit www.skyteam.com.